I remember it well. I was in 6th grade. I wore painfully-thin, white, Peter Pan blouses as part of my school uniform. One day my Mom announced that it was time for me to wear a bra. Fortunately I didn't have to be dragged to the mall for a fitting. Really, there wasn't much to fit. I had older sisters, so Mom just instructed me on which bras would fit me. There were a couple to choose from. They were readily available in our shared underwear drawer. My kids freak out about this concept. A generic 'girl' drawer for underwear, socks, and bras. Reach in and scoop something out. Ownership wasn't a concept I was overly familiar with in childhood. I did as instructed. Wore the dang bra to school. After school is another story. The school year had just begun. The weather was blistering. I was a tomboy. I couldn't wait to get outside to play. I ripped off my uniform and the bra. Then I carefully chose a thick red sweatshirt. I thought I was so clever. No one knew that I had ditched the bra. I assumed that the rivers of sweat running down my face and body as I raced around in a sweatshirt on an 80 degree day raised no eyebrows either. I have written before about Mini's reluctance to graduate to a non-stretchy, non-pre-teen, non-sports bra. I searched high and low in the fall for a bra that had a bit more 'meat' to it. Mini has grown accustomed to the little strappy numbers in vibrant color that overflow her drawer. I struggled to find something that would fall into the 'I-need-some-kind-of-a-cup' variety verses the 'I-just-need-an-extra-layer-of-fabric-here' version. As I was packing for Scotland, I pulled Mini aside. I witnessed her changing and that bra was no longer cutting the mustard. It was like two triangular postage stamps connected by some very taxed straps. Let me clarify. My kid still barely needs a bra, but the need is a tad more present than it once was. She comes from flat chested stock, which apparently she is - as I have always been - grateful for. I think teenage girls are either excited for the next chapter of their life aka 'developing', or they aren't ready to welcome this kind of change. Mini and my former teenage self fall into the latter category. Am I missing another category? Please enlighten me. While the girls were at dancing class one night, I ran into Kohls and picked up a few 'real' bras. It is a pity that there weren't any cup sizes that were 'barely A.' Maybe I wasn't thorough enough in my search. No time for that. I made Mini try them on at home. The first one was a toss up between a sports bra and a bra with a cup. She rejected it the instant she put it on. The cup was a bit too generous for her. The next one was the real deal. Plain and simple. No underwire. Very basic. She tried to reject that one too, but I told her that we had found her next bra. Discussion over. 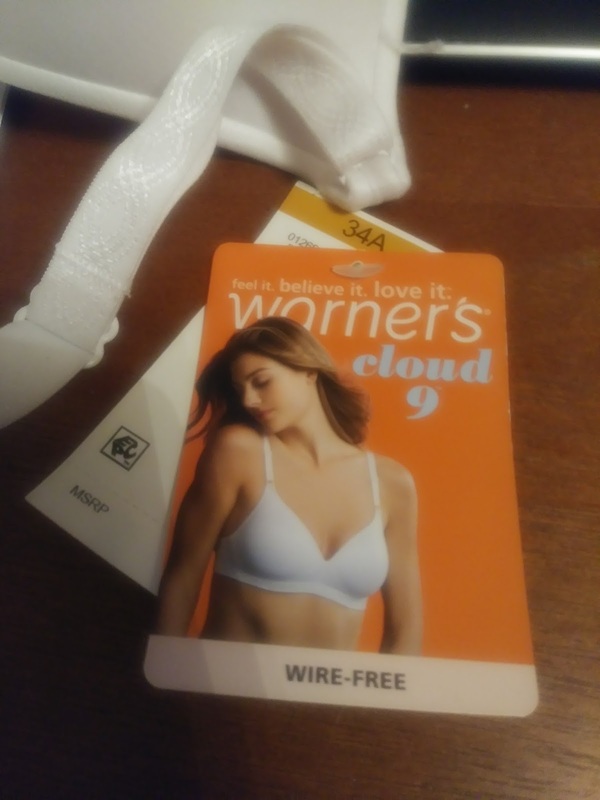 look like the model on the bra tag. She apparently has a fear that someone is going to accuse her of trying to exaggerate her cup size. The cup on this one may be a bit spacious for her, BUT it will be perfect in the very near future. Done. In my rush to clean up the kitchen, I had overlooked the fact that our bra-size heated discussion had spilled over into the kitchen. Eddie was watching a basketball game in the family room. 'OK, I think I might throw up now.' Oops, sorry Ed. My girl is the worst about bra shopping. She doesn't even want to be seen in the bra department. One day we were in Target and I said, "Let's check out the bras. I think you need a new one." I thought she was going to die! "SHHHHHHH! PEOPLE WILL HEAR YOU!!!!" This is one of the few times I got to roll my eyes at HER for a change! I remember my mom intentionally embarrassing me in the drug store because I didn't want her to ask a stock boy who was my age if they had any boxes of maxipads in the back. I was mortified and she insisted on asking when they would get more in, etc. I suppose baptism by fire was her mindset. Not a fan of that approach!